Since 2015, the partnership program with NYC Parks has helped to transform more than 200 sites in historically underserved parks across the five boroughs. Since it launched in 2015, the program has provided training to nearly 100 gardeners and has helped to improve more than 200 sites in underserved neighborhoods across the five boroughs. The impact of the program can be seen in new and replanted garden areas, repainted playground areas, and refurbished basketball and handball courts in parks across New York City. Led and funded by the Central Park Conservancy Institute for Urban Parks, the immersive five-day training program covers core urban park management skills, including site assessment, landscape management, horticulture, visitor experience and engagement, trash management, and volunteer management. The Conservancy continues to support the gardeners once they return to the field through its Five Borough Crew Program, which provides on-site technical assistance and capacity building in New York City parks. 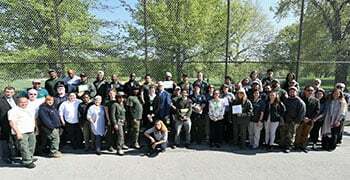 A ceremony attended by NYC Parks First Deputy Commissioner Liam Kavanagh, Central Park Conservancy President and CEO Elizabeth W. Smith, NYC Parks horticultural staff, and Community Parks Initiative gardeners from across the city celebrated the third cohort of gardeners who completed the program. As part of the ceremony, participating gardeners presented horticulture projects that enhanced Wright Brothers Playground in Manhattan and Colden Playground in Queens. The Community Parks Initiative Gardener Training Program is part of NYC Parks’ Community Parks Initiative, which brings greater resources to historically underserved parks in high-need neighborhoods. Funded by Mayor Bill de Blasio and the New York City Council, the initiative has targeted physical improvements in 110 priority parks and playgrounds to date in underserved neighborhoods. The mission of the Central Park Conservancy — a nonprofit organization founded in 1980 — is to restore, manage, and enhance Central Park in partnership with the public, for the enjoyment of all. The Central Park Conservancy Institute for Urban Parks develops programs that advance the stewardship of urban parks and green spaces and teach park professionals best practices for managing urban parks. Urban parks are a critical component of municipal infrastructure essential to the long-term livability and sustainability of cities. Through the Institute, the Conservancy helps to ensure that dedicated public and professional stewards help urban parks deliver the economic, social, health, and ecological benefits to an increasingly urbanized world.